Remove giblets from inside turkey. First make a little stock with these for your gravy later. Next make the Stuffing for the bird. STUFFING helps to keep the bird moist, it bastes from within. Older cookery books often suggest stuffing the turkey at each end; traditionally forcemeat one end and chestnut the other. Simmer the prunes in the wine till tender, cool, stone and cut into four. Soften celery and onion in butter over a low heat, add prunes, herbs, salt and pepper, lemon rind, and chestnuts, broken into pieces. Stir lightly with a fork, allow to cool thoroughly before binding together with the beaten egg. Fill the central cavity with a stuffing of your choice and weigh the turkey again. To calculate cooking time allow 15 minutes per lb for a bird up to 14lb and 20-25 minutes for a larger bird. Or…….how about this adapted version of a Traditional Italian stuffing based on Orvieto Chicken…..
30 garlic cloves unpeeled ..yes! Take the turkey giblets : first remove “oysters” of meat from gizzard with a sharp knife then chop up together with the heart and liver. Dice peeled potatoes, fennel and onion. Pull apart Garlic heads until you have about 30 cloves. Pit olives …..or better still…….buy them pitted! Melt the potatoes, fennel and onions in the olive oil until just soft. Add the giblets and crushed garlic, then stir in the whole garlic cloves ( don’t bother to peel! ), then the olives, fresh chopped rosemary, zest and juice of lemon, salt and pepper and the white wine. Spoon all this mixture into the turkey….Delicious! Melt a little butter and oil in the roasting tin and place the bird on its side on a rack in the tin. Spread it with more butter, or wrap in butter-soaked muslin. Add the giblets and a pint of water to the tin and cover the whole thing in tin foil. Keep the liver to fry and add to the gravy later. 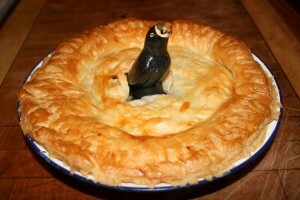 Place the bird in the centre of the hot oven. A little before half time take the turkey out of the oven, turn it onto its other side, baste well with the pan juices and re -cover carefully. Twenty minutes before the end of the cooking time remove the bird from the oven and turn breast up, baste again and sprinkle with salt and pepper and return to the hot oven to brown. Test at the end of cooking time by sticking a long skewer into the thickest part of the thigh, if the juice is clear the turkey is cooked. When cooked allow the bird to REST, covered in a warm place for about 20 minutes. This will make it much easier to carve. To make the gravy first pour off excess fat from the roasting pan. Deglase the tin with a little red wine and red currant jelly scraping up all the residue. Stir in a little stock made from the giblets. Mix a tablespoon of the reserved fat with a desert spoon of corn flour and return to the roasting pan Bring the gravy to the boil over a brisk heat stirring all the time until it is a rich syrupy consistency. Strain before serving. The sliced and lightly fried turkey liver may be added to the gravy after straining. This traditional rillettes recipe uses rabbit to replace some of the pork. Cook the rabbit slowly with garlic, herbs and pork belly, then drain off the fat, first pound, then pull apart the meat with two forks, pile into an earthenware dish and completely cover with the carefully strained fat. Cover with foil and store in the fridge. Eat with toast or crusty bread. Rabbit is stewed so slowly in red wine with beef and pork in this old traditional country recipe that is almost becomes a sauce. Chop 6 shallots and brown them in dripping, add 3 large carrots cut into big pieces. Add one jointed rabbit, 1 ½ lbs each of stewing beef and pork, add garlic and herbs to taste. It is “la grosse cuisine de la campagne” and sounds the perfect dish for cold winter days not, I stress, in the heat wave of summer!